Students are developing a virtual reality game. It is based on James Joyce's "Ulysses." The game is part of a class at Boston College. The name of the game is "Joycestick." Its goal is to expose new audiences to the works of one of Ireland's most celebrated authors. It also gives an idea of how virtual reality can be used to enhance literature. This is according to Joseph Nugent. He is an English professor. He is organizing the project. "This is a new way to experience the power of a novel," he said. "We're really at the edge of VR. There's no guidance for this. What we have produced has been purely out of our imagination." Nugent and his students hope to release a version of the game. It is set to come out on June 16 in Dublin. This would be on Bloomsday. It is the Irish city's annual celebration of the author and novel. They've already showcased their progress at an academic conference. It was held in Rome. In many ways "Joycestick," fills in the blanks of the novel. Many of the places key to the story have been lost to time as Dublin has evolved. That is according to Enda Duffy. She is chairman of the English Department at the University of California, Santa Barbara. Duffy has tried a prototype of the game. "The VR version in this way completes the book," she said. "It makes it real. 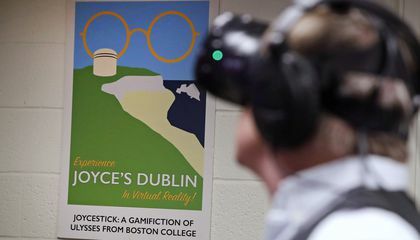 'Ulysses' is an ideal book to be turned into a VR experience, since Dublin is, you might say, the book's major character." There have been a number of efforts to bring works of literature into the gaming world. One was a computer game of F. Scott Fitzgerald's "The Great Gatsby." It became a viral hit in 2011. It copied the look and feel of a classic, 1980s-era Nintendo game. 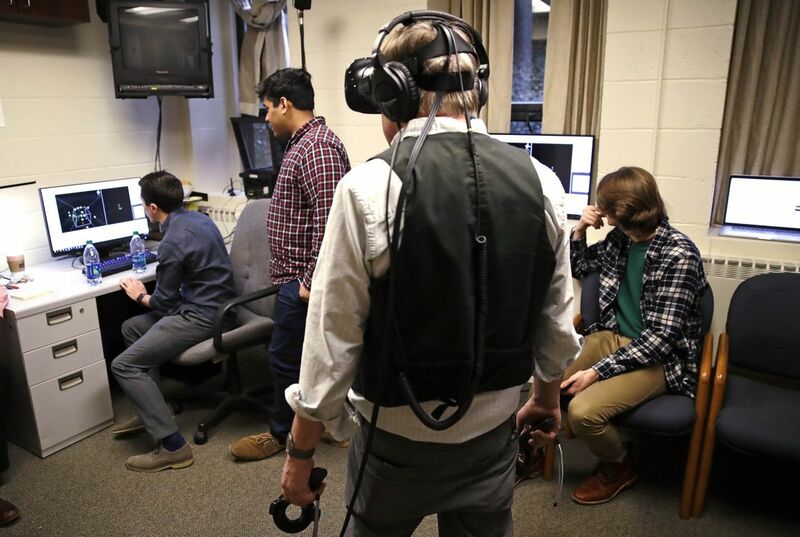 But the Boston College project is unique for trying to use virtual reality technology. So says D. Fox Harrell. He is a digital media professor at the Massachusetts Institute of Technology. He is impressed that the students are taking on such a hard text. "It requires multiple entry points and modes of interpretation. So it will be fascinating to see how their VR system addresses these aspects of the work," said Harrell. He said he hasn't tried the game yet. "Ulysses" is thought to be the height of 1920s-era modernist literature. It traces a day in the life of an ordinary Dubliner. The character is named Leopold Bloom. The title reflects how the novel draws parallels between Bloom's day and "The Odyssey." That is the ancient Greek epic. "Joycestick" isn't meant to be a straight re-telling of "Ulysses." In some versions, that story runs nearly 650 pages long. This is according to Evan Otero. He is a Boston College junior. Otero is majoring in computer science. He is helping to develop the game. The game lets users explore a handful of key environments. They are described in the book. Users can see a military tower where the novel opens. They also can see a cafe in Paris. It is important to the character's past. It's also not a typical video game in the sense of having tasks to complete. There are enemies to defeat and points to rack up. So said Jan van Merkensteijn. He is a junior studying philosophy and medical humanities. He is working on the project. For now, users can simply explore the virtual environments at their pace. Touching certain objects prompts readings from the novel. The project represents an extension of what academics call the "digital humanities." The field merges traditional liberal arts classes with emerging technology. Nugent has had previous classes to develop a smartphone application that provides walking tours of Dublin. It highlights important landmarks in Ulysses and Joyce's life. Nugent is a native of Mullingar, Ireland. He is quick to shift credit for the current project's goal to his group of 22 students. They are studying a range of subjects. These include English, computer science, philosophy, business and biology. The students have also been recruited from nearby Northeastern University and the Berklee College of Music. "These are ambitious kids," Nugent said. "They want to prove they've done something on the cutting edge. They have the skills. They're doing the work. All I'm trying to do is direct these things." Why does Dublin host a celebration of James Joyce and his novel, Ulysses?